Who are the “yellow vest” protesters? What are their demands? What role should the workers’ movement and the far left play in their uprising? The emergence of the “yellow vests” movement that has taken center stage in French politics is rooted in France’s profound organic crisis. Now more than ever, President Emmanuel Macron’s administration appears to be an extremely short-term response to this crisis, having in no way fulfilled its promises or the expectations that brought it to power. The arrogance of this “Jupiterian” administration with its policy of eliminating intermediary agencies and short-circuiting the usual mechanisms for reaching agreements have only aggravated the crisis between representatives and the represented. Macron himself was forced to acknowledge this in an address on the Charles de Gaulle Bridge on November 14. Macron’s weak Bonapartism has made the symptoms of France’s crisis even more evident. The drop in support for him was accelerated by the Benalla affair, where Macron’s deputy chief of staff was caught beating up a protester at a demonstration while impersonating a police officer. There were also the resignations of Hullot and Collomb, former minister of environment and minister of interior, respectively. As the labor unions have not tried to address the rise in taxes, other forms of mobilization emerged. In the context of the bourgeois bloc’s support for Macron’s government, its narrow social base and the lack of a structured opposition rooted in working-class organizations, we are witnessing the emergence of a “populist bloc” composed mainly of working-class people and impoverished middle-class sectors of suburban France. The irony of this story, undoubtedly, is that this bloc has emerged not in the electoral arena nor as the social base of a charismatic leader, as some like France Insoumise or Chantal Mouffe would have guessed, but in the streets. This France of the suburbs and the ruined small and mid-sized cities is at the heart of the mobilizations. It is the losing side of a profound social and geographical rift between the metropolis and the “province.” But the problem is not geographical per se, insofar as this suburban area is inhabited both by the upper middle classes, which are part of the bourgeois bloc backing Macron, as well as workers, struggling sectors and people who moved to the “banlieue” from the big cities. This scenario is not geographically determined or the result of a mechanical opposition between the metropolis and the periphery, as posited by some authors on the far right. Rather, the central factor is the dynamics of the subaltern classes in the suburbs and small towns. The processes of gentrification in the metropolis and satellite cities, the expansion of the manufacturing structure, the relative deindustrialization after the 1980s, as well as the destruction of the local railway system for the benefit of high-speed interurban trains (TGV), have forced a very large number of workers to drive long distances to get to work. In this way, the geographical and social issues overlap, although the latter clearly predominate. This is associated with the “desertification” of all kinds of public services in those areas, which also forces people to go on long commutes for a simple administrative task or to seek medical attention. The destruction of public services is a crucial issue, considering that until the 1980s, during years of economic growth, the welfare state was presented to justify the direct and indirect taxes collected by the state. For this reason, demands or protests related to excessive taxes have historically been associated with the liberal right in France. Since this “pact” in relation to the “welfare state” has been broken, taxation is increasingly perceived by this suburban France as a kind of “double burden.” It is forced to pay rising taxes for services from which it benefits less and less. In this context, against the backdrop of growing unemployment in some areas that are less economically “dynamic,” a condition aggravated by a general decline in purchasing power (about 440 euros in the last 10 years) and attacks against retirees, the increase in fuel prices and taxes imposed by the government are viewed by inhabitants who are more and more dependent on their cars as the ultimate provocation, leading to an outbreak of mass rage. The movement is formed in the image of suburban France “from below”; it is profoundly heterogeneous, both socially and politically, and therefore difficult to assess. Some characterize it as a form of “jacquerie,” referring to the peasant revolts that spread across France under the ancien régime, which were fundamentally spontaneous and violent and brought together different social strata. 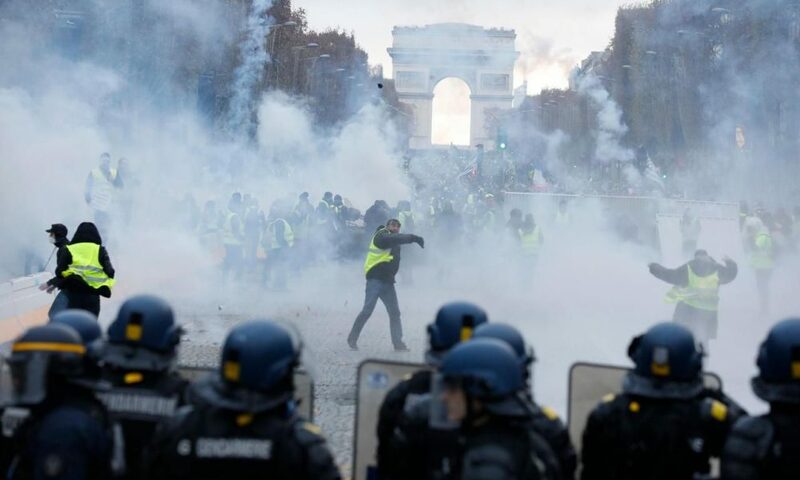 The protests also evoke the explosive movements that shook France in the early 1960s and foreshadowed those of 1968, which also took up the peasants’ methods of struggle. But although it may be too early for precise definitions and forecasts, it is now possible and necessary to establish, especially given the fears that have arisen within the workers’ movement, what the yellow vest movement is not. The government has tried to paint itself as progressive against what it refers to as the “extremists” and “populists” of the yellow vest protesters. However, the protests are not dominated by the extreme right. Yes, the National Front and small groups have tried to ride the wave of protests which are large and spontaneous. While there have been vile and intolerable racist, xenophobic, homophobic and Islamophobic acts, they are very marginal considering the number of barricades and pickets that have been set up over the last few days. As a whole, the movement does not echo those sentiments. Nor is it a right-wing anti-tax movement like those that gave rise to the Tea Party in the United States; it is not a movement led by a libertarian ideology that demands a reduction of the state’s role in the economy, the destruction of public services and so on. The yellow vest protesters are instead denouncing a form of unfair taxation and expressing opposition to the “desertification” of public services in rural or suburban territories. It is not a movement manipulated by a sector of the transportation companies or corporations linked to the oil sector, as some feared at the beginning, and as was the case with the truckers’ movement in Brazil last May, or the “Forconi” movement, the anti-tax mobilization that shook the government of Letta, Italy, in 2013. It is not a movement fundamentally composed of or centered around sectors of the petit bourgeoisie and the middle classes (artisans, people of the liberal professions or self-employed workers). Rather, it is composed of a sector of workers, retirees, public and private sector employees and the unemployed. There are also numerous women, especially of young women in the pickets and barricades. It is thus an interclass, but by no means reactionary, movement that is the primary challenge to the Macron government. As a result, it is a duty of the workers’ movement and left organizations to do everything in their power to further this process and give it a class perspective, by contributing their demands and methods of struggle. In this sense, the yellow vest movement is an expression of precisely this mass of impoverished petit bourgeoisie and workers who make up the majority of the labor force, but not the most advanced sectors. In this sense they come with their prejudices: they are often not unionized, sometimes part of the electoral base of the National Front or France Insoumise, and they are no doubt largely composed of abstentionists who are unaccustomed to striking and especially to confronting the police. They are full of illusions about how the situation could improve with lower taxes and so on. The movement, however, now objectively contradicts the policies promoted by employers and is colliding head-on with Macron and his government. 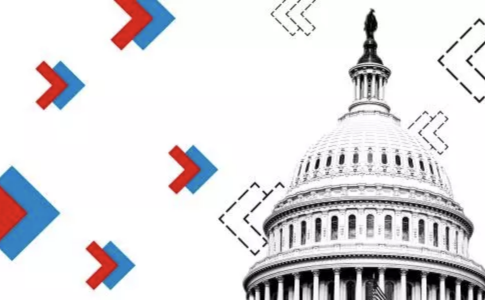 Overall, the situation is characterized by a rapid acceleration of political processes, with increasing tendencies toward direct action and forms of radicalization, including among less politicized sectors. According to Trotsky’s logic in the 1930s, although this movement has a significant working-class component, this type of process can reinforce not only the tendency toward revolution but also a fascist counterrevolution. This is why it is crucial that the labor movement seek to lead the yellow vest movement and why the trade union leaders are playing such a nefariously divisive role. Some clear examples of this were the statements made by Laurent Berger on behalf of the French Democratic Confederation of Labor, by the new anti-yellow vests boss of Workers’ Force and even the CGT (General Confederation of Labor). The CGT’s press release refused to name the yellow vests and called for a day of “alternative” action to the yellow vest mobilization on December 1. Now the task is precisely to fight against this division and to allow the organized workers’ movement to take its place, with its program and its methods, in the current mobilization. Over the past few days, a few elements have shown that it is possible to achieve this goal. 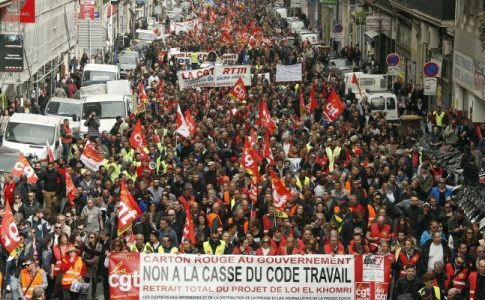 These have included the calls by many intermediate structures of the CGT, such as the Chemical Federation of Departmental Union 13, or the FO truckers, to join the yellow vest mobilization and strike for higher wages. 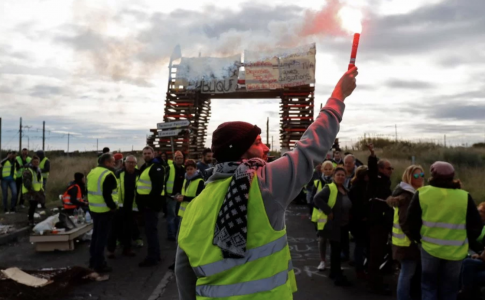 There is also an incipient unity between the yellow vests and the sector of the CGT that went on strike at the Méde refinery, near Marseille, and with the stevedores at Le Havre and Calais. Another sign of this is the case of the city of Perpignan, where a delegation of yellow vest protesters knocked on the door of the Departmental Union of the CGT to propose that they join them. That this unity is possible is also shown by the convergence of the railway workers of Intergares, the Committee for Truth and Justice for Adama Traoré (a young black man murdered by the police), anti-racist and LGBT groups and sectors of the students’ movement with the yellow vest protesters in the rally that took place December 1. More generally there is a perceptible shift on the ground in both directions. On one hand, support for the movement is rising more among supporters of the radical left than among those of the extreme right: 83% of National Front supporters think the movement should continue compared to 92% of France Insoumise supporters. On the side of the anti-tax right, the Republicans believe that the movement has led to too much anarchy. While some of the initial support for the yellow vest movement has begun to cool down, it also seems to have drawn conclusions from its own experience. After the successful mobilization of November 17th and in light of the government’s intransigence, which has been weakened but is still determined to push through austerity at all costs, the yellow vest protesters are now confronted with the question of how to continue the movement. Faced with the impossibility of maintaining their blockades during the week, the idea of calling on other sectors began to circulate rapidly, sometimes with a proposed “schedule” for ambulance drivers, passenger car drivers, railroad conductors and others to work shifts. 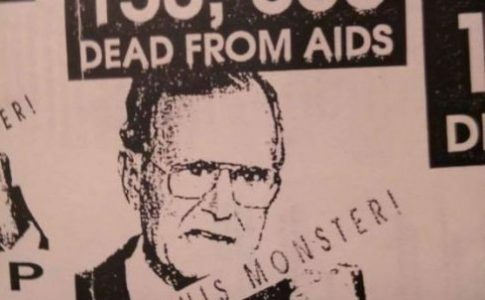 We have thus seen progress in the methods implemented, often with a critical assessment of the blockade against motorists, in favor of a method targeting big corporations and state symbols. • the mass hiring of workers in schools, hospitals and transport companies; the construction of new local structures in suburban area; and the repeal of the railway reform that eliminates small lines. • Against the Fifth Republic, elimination of the “monarchical” functions of the president, dissolution of the aristocratic Senate in favor of a single chamber with legislative and executive powers, where representatives would be elected by universal suffrage based on local assemblies and would be revocable at any time by their constituents and receive the average salary of a specialized worker. Measures like these can advance the struggle for a true government of the workers and the people, which would be a revolutionary solution to the dictatorship of a minority of rich individuals and big capitalists. They echo the more “anti-system” and radical aspects of the yellow vest movement to which revolutionaries must respond, rising to the challenge both at the programmatic level and with concrete actions. This article was published on November 25 in Révolution Permanente Dimanche. It is reproduced here with some updates by the author.